1995 Fadal VMC 6030HT mdl. 907 CNC Vertical Machining Center s/n 9506979 w/ Fadal CNC32MP Controls, 21-Station ATC, CAT-40 Taper Spindle, Dual Floppy Discs, 4 th Axis Prewire (NO BOARD), Rigid Tapping, High Speed CPU, Graphics, 30” x 62 ½” Table, Coolant. 1997 Fadal VMC 4020 mdl. 906-1 CNC Vertical Machining Center s/n 9707398 w/ Fadal CNC88HS Controls, 21-Station ATC, CAT-40 Taper Spindle, 28” Extended “Z” Axis, 422k Memory Expansion, Rigid Tapping, High Speed CPU, Graphics, Hand Wheel, Servo Coolant, Tool Load Comp, 20” x 48” Table,Coolant. 1997 Fadal VMC 4020 mdl. 906-1 CNC Vertical Machining Center s/n 9707399 w/ Fadal CNC88HS Controls, 21-Station ATC, CAT-40 Taper Spindle, Hand Wheel, 422k Memory Expansion, Rigid Tapping, High Speed CPU, Graphics, Servo Coolant, Tool Load Comp, AC Axes Motors, 20” x 48” Table, Coolant. OOYA RE-2M CNC Vertical Machining Center s/n 835415 w/ GN-Fanuc 6 Series Controls, 32-Station ATC, CAT-50 Taper Spindle, Oilmatic Oil Cooler, 33” x 90 ½” Table, Coolant. Enshu VMC 650 CNC Vertical Machining Center s/n 141 w/ Fanuc System 11M Controls, 30-Station ATC, CAT-50 Taper Spindle, Hand Wheel, 26” x 63” Table, Coolant. Enshu VMC 650 CNC Vertical Machining Center s/n 132 w/ Fanuc System 11M Controls, 30-Station ATC, CAT-50 Taper Spindle, Hand Wheel, 26” x 63” Table, 30” x 63” Aluminum Tapped-Hole Top Fixture Plate, Coolant. Enshu VMC 610 CNC Vertical Machining Center s/n 126 w/ Fanuc System 6M Controls, 30-Station ATC, CAT-50 Taper Spindle, Hand Wheel, 24” x 55” Table, 26” x 57” Tapped-Hole Top Fixture Plate, Coolant. 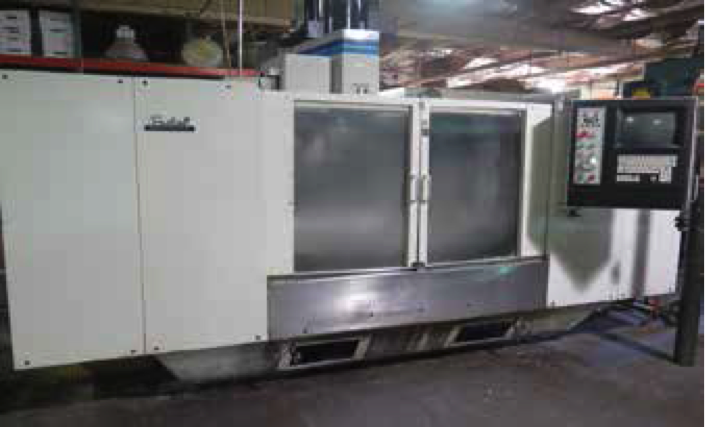 Daewoo PUMA 10S CNC Turning Center s/n 830005 w/ Fanuc System 11T Controls, 12-Station Turret, Hydraulic Tailstock, 10” 3-Jaw Power Chuck, Jorgensen Chip Conveyor, Coolant. Hardinge HLV-H Wide Bed Tool Room Lathe s/n HLV-H- 1526 w/ 125-3000 RPM, Inch Threading, Tailstock, Steady Rest, Power Feeds, KDK Tool Post, 5C Collet Closer. Hardinge HC Hand Chucker s/n HC-414A w/ Threading Attachment, 125-3000 RPM, 8-Station Turret, Collet Closer. Bridgeport Vertical Mill s/n 205142 w/ Bridgeport DRO, 2Hp Motor, 60-4200 Dial Change RPM, Chrome Ways, Power Feed, 9” x 42” Table. F.A. Nugier mdl. H40-14 40-Ton Sliding Ram Hydraulic H-Frame Press s/n 2601017. Grob Type NS-24 24” Vertical Band Saw s/n 1564 w/ Blade Welder, 24” x 28” Table. Pacific Abrasive 1 ½” Belt Sander w/ Stand. Dayton Pedestal and Bench Grinders. Quincy mdl. QT50ANA32P 50Hp Rotary Vane Air Compressor s/n 93072H w/ Pre-cooler, 200 Gallon Tank, Great Lakes GRF-100 Refrigerated Air Dryer. (2) 8” Angle-Lock Vises, (10) Kurt 6” Angle-Lock Vises, (6) Eron 4” Angle-Lock Vises, (100) CAT-50 and BT-50 Taper Tooling, (90) CAT-40 Taper Tooling, Huot Tooling Carts, Yuasa 10” Rotary Index Table, Troyke BH-12 12” Rotary Table, 8” Rotary Cross Slide, 8” 3-Jaw Indexing Chuck, Yuasa 5C Adjustable Angle Collet Closer, 5C Indexing Heads, 5C Collet Closers, 5C Spin Fixtures, 5C and R8 Collets, (7) Huot Drill Cabinets, Insert Milling and Turning Tooling, Drills, Taps, Reamers, Endmills. Height Gages, Sunnen PG-800- S Precision Bore Gage w/ Sunnen PG-400- S Setting Fixture, Marvin 4” x 10” Dividing Bench Center, Mueller Dial Groove Gage, Mitutoyo 6”-12” OD Mic Set, Fowler and NSK OD Mic Sets, Brown &amp; Sharpe 0-.5” Master Micrometer, 0-1” Indicating OD Mic, Mitutoyo SPI and Brown & Sharpe Bore Mics, Diatest, Mitutoyo and SPI Dial Bore Gages, Mitutoyo Blade, Disc, Point and Spline.